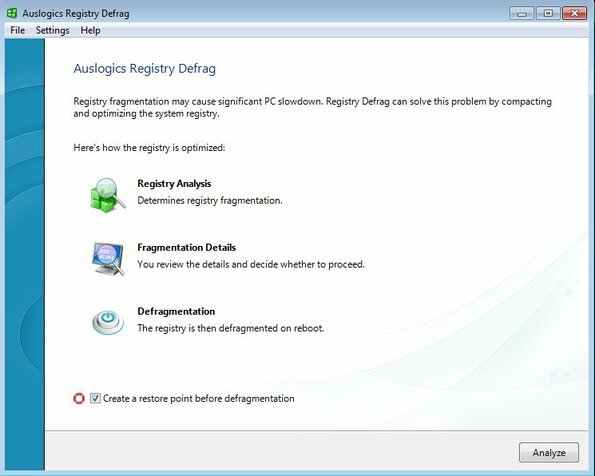 Auslogics Registry Defrag is a free registry defragmentation software for Windows which you can use in order to defragement Windows registry. It’s a known fact that with time, Windows registry tends to get cluttered with junk. This can especially happen if you install and deinstall a lot of applications. With Registry Defrag, you can remove this junk and hopefully speed up your Windows PC in just a few clicks. This free registry defragmentation software is very small and very simple to use. To optimize registry and defragment it, you just need to follow a wizard, first step of which can be seen on the screenshot down below. There’s a total of three steps, first is registry analysis, where your registry is scanned in order for Registry Defrag to see the extent of the damage. After that you’ll be able to see the results of the scan and decide whether or not you really want to proceed with the defragmentation. Registry Defrag will have to restart your computer in order to apply fixes to your system. 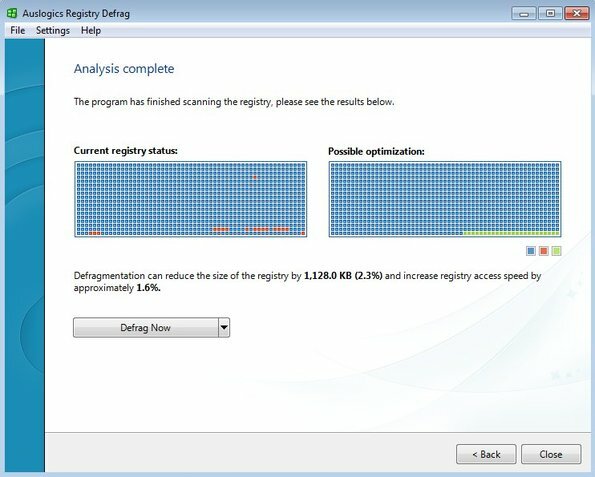 With defragmentation you can optimize registry the same way that hard disk space is optimized during defragmentation, by rearranging data in a more orderly fashion so that Windows can access it faster. Here’s a few pointers to help you get started. The only thing that’s required from you is to click on the Analyze button in the bottom right corner of the main window that comes up after running Registry Defrag (see image above). How long the analysis will take depends on the shape that your registry is in. Health of our registry was pretty good to begin with, so we gained around 1.6% in speed. If you click on the Defrag Now button you computer is gonna be restarted. Click on the drop down arrow next to it opens up additional options with which you can schedule the registry defragmentation at next reboot. Make sure that if you’re gonna be clicking on the Defrag Now button that you do not have any programs running and that you save all your work. Next time that you restart your computer, registry is gonna be defragmented and optimized. 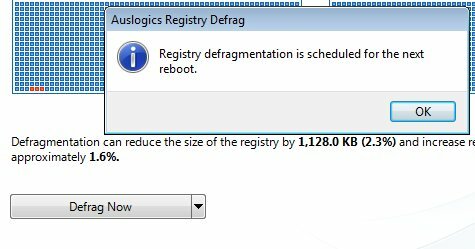 Auslogics Registry Defrag is very easy to use and it does everything as advertised. All computers, even the newer ones have problems if you don’t take proper care of registry. Registry fragmentation could cost you performance so it’s a good idea to perform occasional defragmentation. Try this free registry defragmentation software and let us know how it goes. Get it for free.